CREDIT: A. BARTH (UCI), ALMA (NRAO/ESO/NAOJ); NASA/ESA HUBBLE; CARNEGIE-IRVINE GALAXY SURVEY. Using the Atacama Large Millimeter/submillimeter Array (ALMA), a team of astronomers has delved remarkably deep into the heart of a nearby elliptical galaxy to study the motion of a disk of cold interstellar gas encircling the supermassive black hole at its center. These observations provide one of the most accurate mass measurements to date for a black hole outside of our Galaxy, helping set the scale for these cosmic behemoths. To obtain this result, Aaron Barth, an astronomer at the University of California, Irvine, and lead author on a paper published in the Astrophysical Journal Letters, and his team used ALMA to measure the speed of carbon monoxide gas in orbit around the black hole at the center of NGC 1332, a massive elliptical galaxy approximately 73 million light-years from Earth in the direction of the southern constellation Eridanus. "Measuring the mass of a black hole accurately is very challenging, even with the most powerful telescopes on Earth or in space," Barth said. "ALMA has the revolutionary ability to observe disks of cold gas around supermassive black holes at small enough scales that we can clearly distinguish the black hole's influence on the disk's rotational speed." The ALMA observations reveal details of the disk's structure on the order of 16 light-years across. They also measure the disk's rotation well within the estimated 80 light-year radius of the black hole's "sphere of influence" -- the region where the black hole's gravity is dominant. Near the disk's center, ALMA observed the gas traveling at more than 500 kilometers per second. By comparing these data with simulations, the astronomers calculated that the black hole at the center of NGC 1332 has a mass 660 million times greater than our Sun, plus or minus ten percent. This is about 150 times the mass of the black hole at the center of the Milky Way, yet still comparatively modest relative to the largest black holes known to exist, which can be many billions of solar masses. 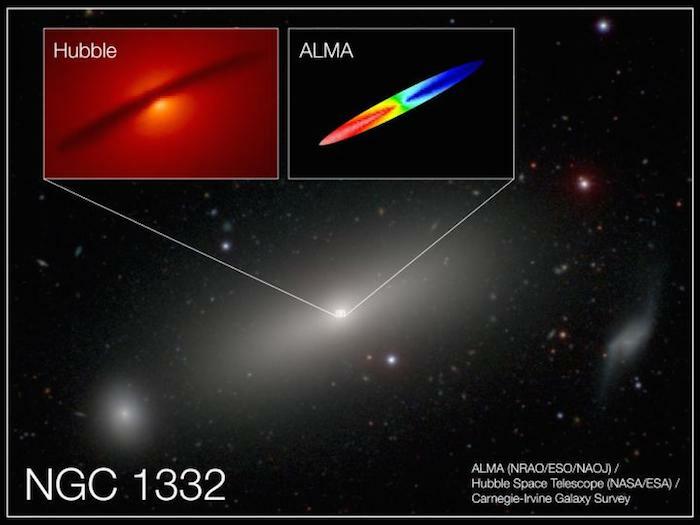 ALMA's close-in observations were essential, the researchers note, to avoid confounding the black hole measurement with the gravitational influence of other material - stars, clouds of interstellar gas, and dark matter -- that comprises most of the galaxy's overall mass. "This black hole, though individually massive, accounts for less than one percent of the mass of all the stars in the galaxy," noted Barth. "Most of a galaxy's mass is in the form of dark matter and stars, and on the scale of an entire galaxy, even a giant black hole is just a tiny speck in the center. The key to detecting the influence of the black hole is to observe orbital motion on such small scales that the black hole's gravitational pull is the dominant force." This observation is the first demonstration of this capability for ALMA. Astronomers use various techniques to measure the mass of black holes. All of them, however, rely on tracing the motion of objects as close to the black hole as possible. In the Milky Way, powerful ground-based telescopes using adaptive optics can image individual stars near the galactic center and precisely track their trajectories over time. Though remarkably accurate, this technique is feasible only within our own Galaxy; other galaxies are too distant to distinguish the motion of individual stars. To make similar measurements in other galaxies, astronomers either examine the aggregate motion of stars in a galaxy's central region, or trace the motion of gas disks and mega-masers -- natural cosmic radio sources. Previous studies of NGC 1332 with ground- and space-based telescopes gave wildly different estimates for the mass of this black hole, ranging from 500 million to 1.5 billion times the mass of the Sun. The new ALMA data confirm that the lower estimates are more accurate. Crucially, the new ALMA observations have higher resolution than any of the past observations. ALMA also detects the emission from the densest, coldest component of the disk, which is in a remarkably orderly circular motion around the black hole. Many past black hole measurements made with optical telescopes, including the Hubble Space Telescope, focused on emission from the hot, ionized gas orbiting in the central regions of galaxies. Ionized-gas disks tend to be much more turbulent than cold disks, which leads to lower precision when measuring a black hole's mass. "ALMA can map out the rotation of gas disks in galaxy centers with even sharper resolution than the Hubble Space Telescope," noted UCI graduate student Benjamin Boizelle, a co-author on the study. "This observation demonstrates a technique that can be applied to many other galaxies to measure the masses of supermassive black holes to remarkable precision." The team is composed of Aaron Barth (University of California, Irvine), Benjamin D. Boizelle (University of California, Irvine), Jeremy Darling (University of Colorado, Boulder), Andrew J. Baker (Rutgers, the State University of New Jersey, Piscataway), David A. Buote (University of California, Irvine), Luis Ho (Kavli Institute of Astronomy and Astrophysics, Peking University, China), and Jonelle L. Walsh (Texas A&M University, College Station). The Atacama Large Millimeter/submillimeter Array (ALMA), an international astronomy facility, is a partnership of the European Organization for Astronomical Research in the Southern Hemisphere (ESO), the U.S. National Science Foundation (NSF) and the National Institutes of Natural Sciences (NINS) of Japan in cooperation with the Republic of Chile. ALMA is funded by ESO on behalf of its Member States, by NSF in cooperation with the National Research Council of Canada (NRC) and the National Science Council of Taiwan (NSC) and by NINS in cooperation with the Academia Sinica (AS) in Taiwan and the Korea Astronomy and Space Science Institute (KASI).